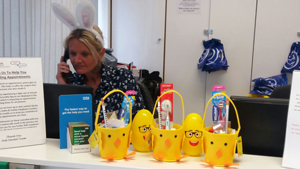 Easter Saturday, we hosted a child friendly Easter Egg Hunt. 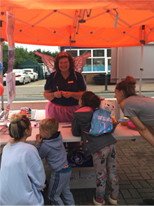 Children were encouraged to visit the practice for a NHS check up and fun and games. 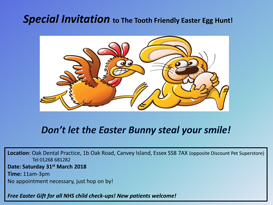 All children that attended left with a tooth-friendly Easter gift of an Easter basket full of dental goodies. 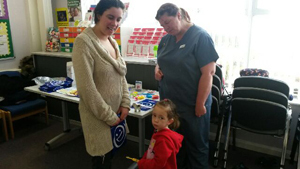 Staff visited Play Planet Pre-school to promote oral health to the toddler group, parents and staff. 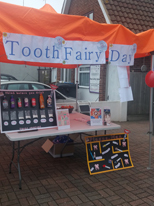 A presentation covering information on teething, healthy teeth and gums, diet, brushing and the importance of regular visits to dentist was given to the group. 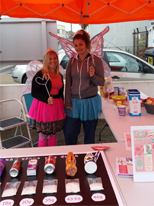 During the session, the attention of the children was captivated by our display showing hidden sugars in various popular food and drinks and a display done to show correct brushing technique. Sadly the weather was bad but it didn't stop us! Tooth brushing instruction and the sugar shocker game proved very popular with the kids, who had to weigh out the amount of sugar they thought were in some common foods. One little boy even gave the Tooth Fairy his dummy which was really positive. Staff at Oak Dental Canvey visited local school Leigh Beck Junior in conjunction with their human body assignment. Staff focused on diet and brushing techniques and all the children had a go at flossing. They played a sugar game with a spinning wheel and demonstrated what happens to teeth during the decaying process using Coke. 78 children were presented to all aged between 8 & 9 years old. 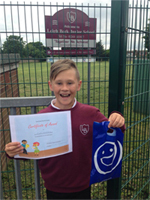 The children genuinely enjoyed the session and were given a goodie bag and certificates. Here's Ellis showing his appreciation! To raise awareness of Oral Health and healthy eating for both adults and children, staff visited Little Lions Children's Centre where most children are under 4 years old. 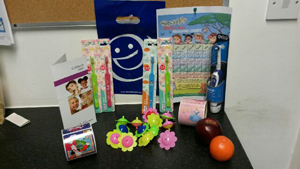 Parents were given a talk about Oral Health and staff gave out fresh fruit and goodie bags to the children. Thank you to all our patients that took part in our Annual Patient Satisfaction Survey during November 2015. Your feedback is really important to us as it helps us to improve our service. We were very pleased to find that 98% of our patients would recommend us to friends and family. Ask us how Clearstep Invisible Braces can work for you to give you a smile you can be proud sharing. Ask for an appointment with Devi. All the children really enjoyed the crocodile puppet giving oral hygiene advice and goody bags we provided. Whitening Tray Offer-Opalescence.go Was £124.99 now £50.00 while stocks last! We are proud to introduce Inman aligners to our list of treatments offered here at Oak Dental Canvey Island. Patients wishing to enhance their smile should speak to their dentist about how they could benefit from Inman Aligner teeth alignment. Hygienist sessions have been reduced from £45 to £35. Book your appointment today. Teeth Whitening for £250 including one visit to see the hygienist. Hurry have a brighter whiter smile in time for Christmas. Oak Dental Canvey Island is proud to welcome our new dental hygienist Lucy Grimsey. £45 per session. To book an appointment please call us now. We are currently refurbishing our patient waiting room. We hope that you will be comfortable in your new waiting area. Oak Dental reception team compliment the level of care shown by Devi Gopinath in person and on the telephone the reception team of Jo, Lorraine and Tracy are all exemplary. Copyright © Oak Dental Canvey Island. All rights reserved.